Harold Gerrard Connor, age 90, passed away at 8:00 AM on Tuesday, February 5, 2019 at Christian Buehler Home in Peoria, IL. Harold was born in Danville, IL on May 14, 1928 to Harold Sr. and Mary (Hembrey) Connor. He attended Grant Elementary School. At the age of 12, he began caddying at Harrison Golf Course. He worked at Howard Auto Parts at age 14. Harold attended Danville High School graduating with the class of 1946. He then went to work for Sieg Peoria Auto Parts in 1947. Harold married Maurine James on September 16, 1950 in Paris, IL. He was drafted in the US Army in 1950 and served 21 months during the Korean War. Harold attended Basic training at Camp Cook in California, went overseas in 1951 serving with occupying forces in Japan for 6 months and 3 months in Korea. He served his last 3 months in Colorado Springs, CO at Camp Carson. 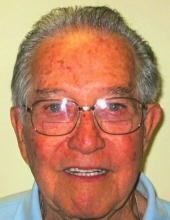 Harold returned to Danville, IL and returned to work with Sieg Peoria Auto Parts. Harold and Maurine had 8 children. They were active parishioners at St. Patrick’s Parish. They were also active in Cub Scouts and Girl Scouts. Maurine worked to establish a kindergarten at St. Patrick School and eldest daughter Judy attended that first class. Harold served on the St. Patrick School Board for 3 years. During this time period, both Harold and Maurine were active in CFM (Christian Family Movement). Harold and Maurine, with 7 of their 8 children, moved to Peoria in 1971 where Harold served as Sales Manager until 1988, becoming President in 1989 and retiring from Sieg Peoria Co. in 1990. Harold joined Knights of Columbus at age 26, in Danville, and continued his 60-year membership in Peoria (Council 427). He was a 42-year active member in Pride of Peoria Barbershop Chorus, serving on the Board of Directors and President of the Chorus. Also, President of the Past Presidents Club. He appeared on 38 annual shows. Harry Faye and Harold founded the Sounds of Memories singing group to entertain nursing homes and service clubs in their retirement years. Both Harold and Maurine were active parishioners at St. Philomena Catholic Church in Peoria. They also volunteered at OSF St. Francis Hospital for 22 years following their retirement. They moved to Buehler Home in the fall of 2013. Harold was loved and will be missed by his family as well as friends both in Danville and Peoria. Survivors include 8 children: Judith (Martin) Green, Thomas (Kimberly) Connor, Kevin (Deborah) Connor, Joseph (Janet) Connor, David (Kimberlee) Connor, Daniel (Maribeth) Connor, Nancy (Patrick) Nichting, and James Connor; 21 grandchildren, 33 great-grandchildren, as well as, many nieces, nephews, great nieces and great nephews. Harold was preceded in death by his parents, one brother, Frederick, one sister, Joann and nephew, Freddie. A Mass of Christian Burial will be held at 10:30 AM, on Saturday, February 9, 2019 at St. Philomena Catholic Church with visitation being held from 9:00 AM – 10:30 AM prior to mass. Father David Richardson will officiate and burial will follow in Resurrection Catholic Cemetery in Danville, Illinois. Memorials in Harold’s memory may be made to the Children’s Hospital of Illinois. Wright & Salmon Mortuary in Peoria are handling arrangements in Peoria, friends may sign the online guestbook or send private condolences by logging onto www.wrightandsalmon.com. Kruger-Coan-Pape Funeral Home is assisting with the burial at Resurrection Catholic Cemetery in Danville.